Iwashmizu Hachimangu Shrine is one of the most famous Shinto Shrines in Kyoto. Yukio Wada a member of The World Peace Prayer Society in Kyoto contacted Mr. Nishi, Headmaster of the Iwashimizu Hachimangu Shrine, to offer a World Peace Prayer Ceremony (WPPC) in honor of the International Day of Peace. Mr. Nishi kindly accepted their offer. On the day prior to the WPPC, more than seventy people from Kyoto area and Tokyo gathered for an official prayer meeting which embodied the main shrine. They reported that the atmosphere of the shrine was pure and serene. Everyone was moved by the story about the Iwashimizu Hachimangu, Shinto-Shrine, as told by Mr. Nishi. 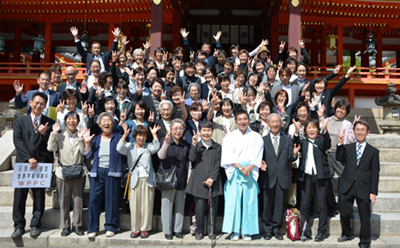 The WPPC was held in the Seiho-den building of the shrine. Everyone felt renewed after praying for peace for the people and land of each country around the world!